Being a fan of Quentin Tarantino movies, I was intrigued by Siren’s range of Pulp Fiction-inspired fruit smoothie beers. Recently, we’ve seen many a brewer explode into the craft beer scene with interestingly-named beverages, only to crash and burn with dull and uninspired ales. But Siren, of course, are a different beast altogether. As you may have seen in our Pompelmocello review, we at Boards and Booze are massive fans of Siren. They’re clever, modern and like to push the boundaries of the craft beer scene: brewing auteurs, if you will. I Love You Honey Bunny is a modern re-invention of a classic done well – a re-invention that reminds you of all the good reasons you like beer in the first place. It’s the third in Siren’s Pulp Fiction trilogy of beer series (preceded by Ten Dollar Shake and Comfortable Silence). 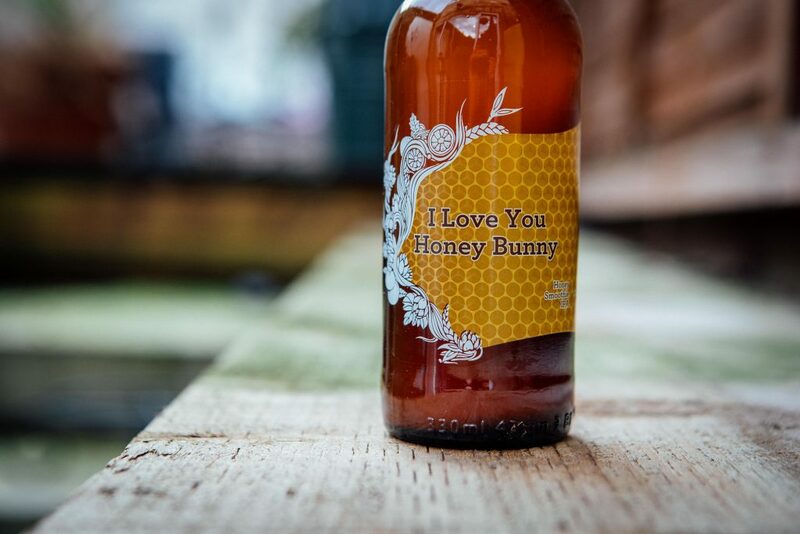 Like Tim Roth and Amanda Plummer, Honey Bunny is a cross-Atlantic collaboration involving Siren and Brooklyn’s Other Half brewery. So, is it sharp, exciting and smooth like John Travolta doing the twist? Or does it fall flat on its back like Mia Wallace after a bad date? All I can say is that the beer has personality. And personality goes a long way. 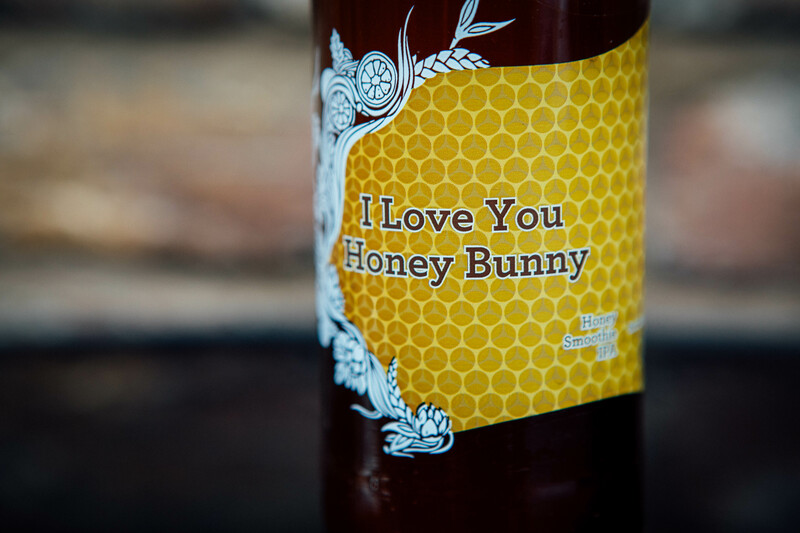 Honey Bunny is described by Siren as a honey smoothie IPA. I’ll be honest, the honeycomb artwork made me sceptical at first. Yes, it does look awesome, but I was wary: honey in a beer means sweet and sickly, right? The honey combines magnificently with the hops, oats and lactose to produce a beer of exceptional quality. Like its predecessors, Honey Bunny balances the sweet additions to its mash with a dry and creamy flavour that leaves a lip-smacking finish. It’s all about the little differences that give this beer a buzz. Pulp Fiction revels in nostalgia: every scene drips with Tarantino’s love of music, movies and television. Everywhere you look, it’s easy to find references to the pop culture of his youth – from Captain Crunch (a cereal famous in the US if not here in the UK) to the 50s love-in that is Jack Rabbit Slims. And with I Love You Honey Bunny I even felt nostalgic for some of the flavours of my own childhood. The light-yellow colour and zesty smell reminded me of sherbet lemons, and the fruity flavour brought back memories of sucking on a pineapple cube on the walk home from school. But it definitely is a proper IPA, and the hoppy mouthfeel is present throughout. With this in mind, and keeping with its American diner feel, this beer would be great with a 16oz beef burger with crisp lettuce, tomato and jalapenos. And cheese of course. Although the characters of Pumpkin and Honey Bunny open the movie Pulp Fiction with a bang, it’s not until the end that they really come into their own. I Love You Honey Bunny is no different. The finish is bitter, lively and absolutely satisfying. It’s a limited edition, so get it while you can. You don’t want to have to wait for the director’s cut.